April 16 (UPI) — French authorities said Tuesday they are trying to nail down details of how the devastating fire began at the Notre Dame Cathedral in Paris, but they know it wasn’t intentionally set. Flames ravaged the 850-year-old cathedral for nine hours, causing the famous spire to collapse and partially destroying the structure. Firefighters were able to avoid total destruction of the facility. The cause of the fire hasn’t been determined but French officials believe it’s linked to restoration work going on at the facility. The fire is being investigated as an accident and officials said they’ve ruled out arson, having found no evidence the flames were intentionally started. Workers surveyed the damage Tuesday to determine what could be preserved. French Interior Minister Christophe Castaner said there’s a structural risk to the building and it will take weeks to rebuild. Authorities are examining whether the fire started on the roof, where the renovations were taking place. Firefighters said they saved the twin bell towers but the building’s roof was destroyed. The Crown of Thorns, the Tunic of Saint Louis and other valuable artifacts were saved from the fire. 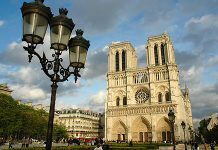 The cathedral was the inspiration for Victor Hugo’s novel The Hunchback of Notre Dame and draws 12 million tourists a year. Crowds of people gathered Tuesday to see the damage to the iconic building. Donations have been pouring in to help rebuild the landmark. The billionaires behind luxury brands Louis Vuitton and Gucci said they will donate $338 million collectively. Francois-Henri Pinault owns a controlling stake in Kering, which owns luxury brands Gucci, Saint Laurent and Alexander McQueen. Bernard Arnault is the chairman of the company that owns Louis Vuitton, Christian Dior and Moet & Chandon champagne. They’re two of the wealthiest people in France. “The Arnault family and the LVMH Group, in solidarity with this national tragedy, are committed to assist with the reconstruction of this extraordinary cathedral, symbol of France, its heritage and its unity,” Arnault’s company, LVMH, said in a statement Tuesday.